Since the show, he has married and toured in the play "Ain't Misbehavin' "
(CNN) -- No one knows better than Ruben Studdard what Adam Lambert and Kris Allen face after the finale. Season two "American Idol" winner Ruben Studdard says life changes after the show. The season two winner of "American Idol" can bear witness to how dramatically life changes once a singer makes it to the finals of the mega-spectacle that is the show. Millions of people tuned in to watch Studdard take on Clay Aiken in the finale of the competition. In fact, only the season five closer (won by Taylor Hicks) has drawn more viewers than the 34.2 million who saw Studdard crowned "American Idol." Since then, much has been made of Studdard's success (or lack thereof) compared to other winners and contestants, such as his good friend Aiken. But the Velvet Teddy Bear, as he is known, says he is very happy with his career, which has included touring in the play "Ain't Misbehavin' " in the role of the legendary composer Fats Waller along with "Idol" alumna Trenyce and almost-contestant Frenchie Davis. Studdard said he loves what he does and is thrilled with his new album, "Love Is," a project that matched him with superstar producers Jimmy Jam and Terry Lewis. CNN spoke with the R&B crooner about his fourth album, life as a newlywed, and why fans shouldn't be surprised to see him shopping at Wal-Mart. CNN: Please tell us about the new album. 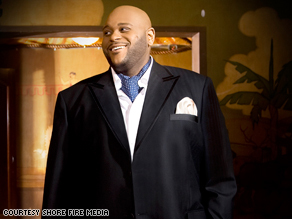 Ruben Studdard: I think this album is different because I got an opportunity to be me. There were really no boundaries on the things that we could do on the record. We had a clean slate and me, Jimmy and Terry were just allowed to be creative. I think this is my best body of work yet. CNN: Were you involved in any of the songwriting? Studdard: I wrote on basically every original song on the album. I've been a songwriter since I was in high school so it was nice to be in a situation where I was allowed to do what I do. CNN: What's the deal with the title of the album, "Love Is"? What is love to you? Studdard: Love is everything. My wife actually named the album. I wanted it to be "Love and Inspiration," but the label said that sounded too much like a gospel album. I asked my wife what she thought and she came up with that, so there it is. CNN: You brought up gospel and you've done that in the past. What are you more comfortable with, gospel or R&B? Studdard: I am comfortable with anything I sing: jazz, gospel, classical. It doesn't matter. I can do it all. CNN: How would you classify your latest album? Studdard: This is the album I think everybody's been asking me to do since I was on "American Idol." Everybody's always told me they felt like I was the heir apparent to folks like Gerald [LeVert] and Luther [Vandross]. As long as I stay focused, hopefully one day I will be considered just as good as Luther Vandross. That's pretty darn hard. CNN: At this point, do you feel like you have had the career so far that you have wanted? Studdard: I feel like I have been totally blessed with everything that I have done. This is my fourth album and that, in and of itself, is a blessing. There are artists who don't make it past album one, so I am thankful that God has given me the opportunity to do what I love, so as long as I am here I'm going to continue to work really, really hard. CNN: Has being married now played into shaping you as an artist? Studdard: It has, I think, calmed me down a lot and made me more compassionate and thoughtful. I'm just glad that I have somebody to share the rest of my life that really cares about me and who I know will always be there for me. CNN: You performed on the show this season, but have you had a chance to watch "American Idol"? Studdard: No, I'm on stage every night at 7:30 [p.m. with the tour of "Ain't Misbehavin' "] and we have been on tour since October doing eight shows a week. CNN: Do you have any advice for whoever is the next "American Idol"? Studdard: Just be prepared for all of the work. It might seem like it's a lot of work while they are on the show, but they have no idea what's about to happen to them. I was on a conference with some of the winners recently and that's exactly what we all talked about. Your life will never be the same. CNN: What's the biggest way your life has changed since you won? Studdard: Probably the ability to go to Wal-Mart without causing a scene. It's funny because you go and people are like "Why are you at Wal-Mart?" I say "What do you mean? I can't take advantage of the low, low prices, too?"